The 2002 FIFA World Cup was notable even before a ball was kicked. FIFA broke new ground in a number of ways starting with the awarding of the first World Cup tournament ever to be jointly staged, to Japan and South Korea. Initially Mexico were one of the bidding nations but when the two Asian nations agreed to a joint hosting of the finals, just before the final decision was made, their bid was chosen unanimously in preference to Mexico. However once the ground-breaking decision was made the governing body almost immediately passed a ruling to prevent anything similar ever happening again. In 2004 FIFA officially banned joint hosting. The 2002 tournament was also to be the last to accommodate the ‘Golden Goal’ method of settling a game. It was the first time Asia would host the world’s top international football tournament and it was to prove a logistical nightmare, not least for the amount of travel that would be required by national teams and their supporters. The flight distance between the two capitals, Seoul and Tokyo, for instance, is 1,152 kilometres with a flight time of just under two hours and between Incheon, South Korea, and Miyagi in Japan it is 1,245 kilometres. When the draw was made, on December 1st 2001, it threw up the now mandatory ‘Group of Death’, Group F which comprised; Argentina, England, Nigeria and Sweden. 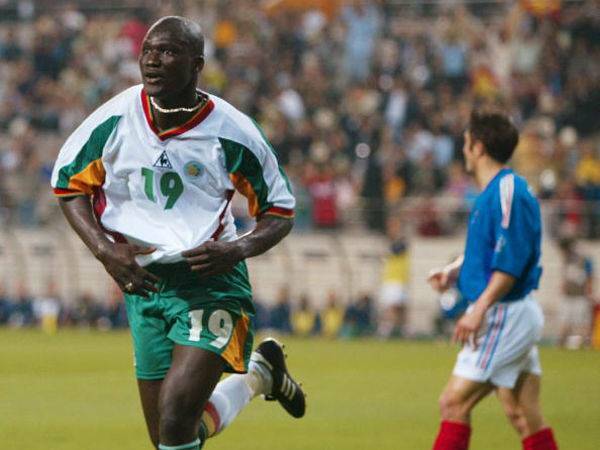 Despite the logistical problems both nations did the tournament proud with their organisation and when the finals actually kicked off the first game, between France, the 1998 World Cup winners, and Senegal, produced the first of many shocks not to mention a number of unwanted records for the holders of the World Cup. Denmark were to advance as Group A winners along with Senegal. Senegal won the curtain raiser 1-0 but more significant was the fact that France were well beaten and Senegal were worthy winners. France never recovered from the initial setback and went out at the group stage with the unenviable record, for a World Cup defending nation, of failing to score a single goal or register a single point. Argentina also failed to progress, from Group F, leaving Sweden as group winners and England as runners-up. Spain won Group B with maximum points as did Brazil in Group C. One notable milestone from this group was China being coached by Bora Milutinovic, who was leading his fifth national team in a fifth consecutive World Cup finals, for him. No happy ending though as China did ‘a France’ finishing with no points and no goals. South Korea advanced from Group D, as did the USA but the co-hosts were soon to attract some very negative publicity for the manner of their further progress in subsequent stages. Germany and Ireland progressed from Group E while Mexico and Italy emerged from Group G. Co-hosts Japan, and Belgium, qualified from Group H.
The Second Round was fairly straight forward as Germany beat Paraguay 1-0, England brushed Denmark aside 3-0 though Spain needed penalties to beat Ireland. It was a bit more exciting when a Golden Goal, from Henri Cammara in extra-time, took Senegal past Sweden after a 1-1 score at full time. Japan went out to Turkey but the other co-host South Korea beat Italy controversially, 2-1, in sudden death extra-time. Byron Moreno of Ecuador was the referee for the South Korea v Italy tie. He was part of the FIFA initiative to have finals matches handled by officials from minor FIFA nations but the 2002 World Cup proved a stage too far for some of the inexperienced officials who either proved out of their depth or, as in one case, benefitted from a surprise gift of a new car. Moreno began by awarding an early, and dubious, penalty to the Koreans, later on a Damiano Tommasi Golden Goal was ruled out for off-side and then an alleged dive by Francesco Totti earned him a second yellow card and an early bath. Ahn Jung-hwan hit the Golden Goal winner in the 117th minute to earn himself immortality in Korean football, and the sack from his Italian club Perugia. South Korea’s victory meant that for the first time in World Cup history teams from; Europe, Asia, North America, South America and Africa reached the quarter-finals for the first time in the same tournament. Brazil ended England’s interest in the World Cup with their 2-1 quarter-final victory. Germany beat the United States 1-0 and Turkey beat Senegal with a Golden Goal in the 94th minute. Unfortunately there was more controversy when South Korea beat Spain 5-4 on penalties after extra-time. During normal time Spain had two legitimate penalty claims rejected by the Colombian referee, Oscar Ruiz, so the co-hosts made history by becoming the first Asian Confederation team to reach a World Cup semi-final. South Korea’s World Cup journey was ended by Germany, 1-0, but goal-scorer Michael Ballack ruled himself out of the Final by picking up a second yellow card. 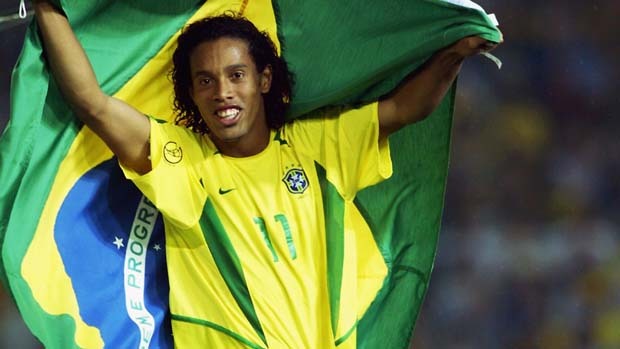 Brazil earned the right to face the Germans with a 1-0 victory over Turkey thanks to a goal from Ronaldo. Brazil won their fifth World Cup by beating Germany 2-0 in the Final. Ronaldo hit both goals to finish Golden Shoe winner as the eight goal leading scorer in the tournament. In the third place play off Turkey beat South Korea 3-2 and the scorer of their opener, Hakan Sukur, registered the fastest goal in World Cup history, just 11 seconds from kick-off. The 2002 World Cup finals were supposed to be the event that transformed Japan, and to a lesser extent South Korea, into a leading football loving nation. Since co-hosting 2002 both nations did go on to qualify for further finals in Germany and South Africa although Japan’s highest FIFA ranking was 23rd and South Korea 35th. There was a dramatic increase in grassroots football as well as strong growth in developing youth programmes in both Japan and South Korea. There was also an increase in footballers from the two nations making high profile moves to major European football. Most notably South Korea’s Park Ji Sung moved to PSV Eindhoven and then Manchester United. Unfortunately the stadium legacy of 2002 was less notable. Both hosts had provided 10 venues, the vast majority of which were new builds but post World Cup attempts to fill 40 to 67,000 all-seater stadia failed miserably. For example Seoul Stadium, home to FC Seoul and the national team was barely one-third full for league games leading to a fair assessment that the economic void created by the differentiation between cost and revenue would ever be filled. Although there was a growth in football interest in the region following 2002 both Japan and South Korea would remain rather large fish in smaller pond that is the Asian Football Confederation when compared to the bigger football aquarium that is world football. Unfortunately for both Japan and South Korea domestic interest in football is directed westwards to the major European football nations where clubs in England, Spain, Germany etc have vast Asian support. Domestic football in the countries that co-hosted the first Asian World Cup merely serves as a breeding ground for young talent that, once it comes to the fore, is immediately targeted by top European clubs. As was the case with 16 year old Son Heung-Min who was poached by SV Hamburg before moving on to Bayer Leverkusen where he became, at 10 million euros, the most expensive signing ever in Leverkusen history. The legacy left by the 2002 World Cup has not been what the successful bidders would have wanted and it is debatable if either country would ever consider staging an event of that magnitude again.